We cleaned out the first of the sweet corn beds and harvested part of the next bed. In total we harvested seven dozen ears of corn; eating a dozen and freezing the other six. The raccoon and opossums have not been as much of a problem as I was expecting. It may be that we have had a mild summer which has left plenty of food in the more secluded woods across the street. I tried making pickle relish for the first time. It turned out perfectly fine. I don’t know that I am a fan of the flavor and I’m not quite sure how to fix it. I’ll give it another try or two before I give up. It seems to be a wonderful use for all of the cucumbers which I leave on the vine too long. I harvested the first of our cantaloupe this last week. They were both the size volleyballs and tasted fantastic. In general this is shaping up to be a great year for the melon crop. We may have more watermelon and muskmelon than we know what to do with before we’re done. I can’t say the same for the pumpkins. It appears that our early pumpkins were attacked by vine borers. The vines are almost dead. We will get about six small (almost gourd-sized) pumpkins, but I was hoping those vines would be producing for another month or two. Meanwhile our jack-o-lantern and giant pumpkins seem to have been spared the borer, but are yet to set any fruit whatsoever. Finally, the pepper crop is just beginning to come on line. I have a nice mix of colors and flavors this year varying from red and yellow sweet lunchbox peppers to jalafuego jalapenos and red habaneros. I pickled the first batch of jalapenos and also made eight half pints of jalapeno jelly (which is delicious). My mother was always a big jelly maker, and I have only just started making my own jelly. The problem with jelly, and canning in general, is that you actually have to follow the recipe, and I would much prefer to make it up as I go along. I find jelly making to be a wonderful way to help me develop and maintain personal discipline. Mow and weed the yard and gardens. Plant the fall leek and broccoli starts. Plant the fall flower starts. Continue harvesting and processing tomatoes, corn, cucumbers, and peppers. Finish threshing the winter wheat. Catchup on laundry & dishes and clean the house. On a final note, one of my goals for this year was establish habitats to attract native frogs. In particular I was hoping to attract leopard frogs. I like how leopard frogs sound and I think they are beautiful. There are three varieties of leopard frog that inhabit southeast Iowa: the plains leopard frog (most common), the northern leopard frog (common), and the southern leopard frog (rare). This last week I have seen a number of leopard frogs in our melon beds, in the cranberries, and near the lotus pond. I have yet to see the rare southern leopard frog, but I’m going to keep trying to attract them. The tomatoes are in full bloom. So far I am doing a fairly good job of keeping them harvested and processed. This was the first year where I tried a wide variety of heirloom tomatoes in the garden. I planted Brandywine, Moskvich, Pruden’s Purple, Cherokee Purple, and Japanese Black Trifele. I love the Moskvich. They are smaller round red tomatoes. They have all had an excellent flavor. The only downside to them this year is that they seem to have been the most susceptible to the septoria fungus which invaded our garden. The Brandywine’s are solid (as usual). It’s always nice to have such a large meaty tomato in the garden. The Pruden’s Purple are similar to the Brandywine; however, I have found them to be less flavorful. A perfectly fine tomato, but I’m not sure I will be growing them again. The Cherokee Purple have been awful. Even at an early stage the plants were stunted and sickly. At this point the plants have almost completely succumbed to the septoria (despite the organic fungicides) and the flavor of the fruit has been middling at best. The coloration of the tomatoes has also been less than I had hoped for. It is possible I got a batch of bad seeds; however, I will not be growing the Cherokee Purple again. Finally, the Japanese Black Trifele have been very good. They have been almost as disease resistant as the Brandywine and have produced an abundance of medium sized pear shaped fruit with a very dark coloration. The Japanese Black Trifele grow in clumps of five or six which make for excellent picking and ripening. Their flavor has been excellent and mixed with the Brandywine or Moskvich, the darken up tomato sauce and salsa to a very pleasant color. This is the first year I have planted cherry tomatoes and they have been largely disappointing. I tried Black Cherry, Indigo Rose, and Yellow Pear varieties. The Indigo Rose have failed spectacularly. They have a week flavor and fail to ripen. I have enjoyed the Yellow Pear in the past, but this year’s crop does not seem to have good flavor. The Yellow Pear was also the first of my tomatoes to be infected with Septoria. The Black Cherry have been very good with an excellent flavor. They are a little slow to ripen, but are definitely worth it. Pick and process the first two plantings of sweet corn. Make pickle relish and jelly with the cucumbers I have neglected. Clean out the spring leak and broccoli beds. Continue harvesting and processing the tomatoes. Catchup on laundry and clean the corners of the house. On a final note, this was a rough week for the blog. The site had been having difficulty loading for a month or so. I finally got around to trying to clean up the database, and in the process destroyed it. This caused me to recreate the blog from scratch. That was entirely a bad thing, as the theme I was using was no longer being supported by WordPress (which may have been what was causing the problem). Saturday and Sunday was supposed to be my monthly writing retreat, instead it turned in to a blog reconstruction weekend (that task also spilled over into a good chunk of this week). I think I finally have all of the important bits back up and running. Happily, the site does load more quickly now and is easier to update. Unfortunately, the time spent in the mechanics of the blog meant I neglected some of my writing for the week. I hope to be back to a nearly full blogging schedule next week, even as I clean up the last few details of the new blog’s format. 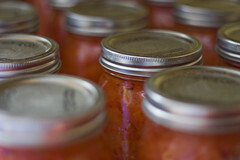 Summer canning season is in full swing. I picked the first batch of cucumbers and pickled them with some fresh dill and (nearly) fresh garlic. Those jars are sitting happily in the pantry next to the remainder of last year’s pickles (we really need to use those up). Next weekend I will probably shoot for a batch of sweet pickles. I also had a chance to can my first batch of salsa for the season. This first batch was small because the tomatoes are just coming on. By next weekend I should have a decent crop to can some tomato sauce. The other problem with making the salsa was that neither the pepper crop nor the onion crop is in full bloom yet. Fortunately, I was able to scrounge up some bell peppers, some jalapenos, and enough white, red, and green onions to make a very passable batch of salsa (perhaps the best batch I have ever made). Next time I am going to cook down my tomatoes before adding my other veggies to try to give the salsa more texture. I picked my first batch of tomatillos this week and I am still not quite sure what to do with them. I have a small basket of them sitting in the kitchen and they may go out to the goats if I do not find a recipe shortly. I expect they would make an excellent mincemeat and once the hot peppers come on and color up, I should be able to mix those in to make a passable salsa verde. I’m sure there are other uses, I just need to spend some time researching. 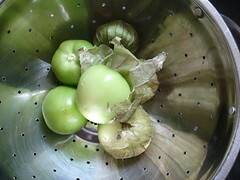 The tomatillo is a truly amazing plant. It has put up with some extreme weather and the septoria (which is ravaging the tomatoes) with hardly a whimper. The plants are tall and strong and bursting with fruit. Of course, the bounty will not be useful if I cannot find something to do with them. The barley got planted last Saturday. We even had a good rain on Tuesday to help it want to germinate. Hopefully we will begin seeing shoots today or tomorrow. It’s a 90 day crop, so the barely harvest should be right about October 23. We need to get the winter wheat in right around October 15, so that might be cutting it a little close. If we run into trouble we can always cut the barely early and feed it to the goats. The sweet corn is in peak form. I did five succession plantings of sweet corn, each about one week apart. So we should be able to pick fresh corn through almost the end of August. Hopefully we will be able to freeze some along the way to keep for this winter. There is nothing like grilling up some steaks and sweet corn on a sub-zero night in the middle of three foot drifts of snow. Dead head the winter wheat and prep it for threshing. Spray the tomatoes with the organic copper fungicide. Harvest the rest of the carrot crop. On a final note, our Australian Shepherd Jessie got out of our backyard sometime during the day on Tuesday. She was gone when we got home from work. I spent about three hours driving around our part of town looking for her. There were some very helpful people on Facebook who told us where they had seen her earlier in the day. Unfortunately, my search was fruitless. I went home when it got too dark to keep looking and stewed on the couch for about half an hour. Jen told me she was going to bed and I asked her to check the front yard on her way. About two minutes later Jessie came bounding down the stairs, covered in weeds, but very happy to see me. We hung out for a few hours then went to bed. I tried to put her outside, but she refused and demanded to sleep in the bedroom that night. I gave in, because I’m a softie. It was two days later that it suddenly occurred to me that Jessie is unaltered. The gestation period for a dog is about 63 days, so we should find out about September 24 if she engaged in any extracurricular activities while she was out.